We welcome you to NAMES IN STONE. A dear friend of ours tells the story of how a single visit to a small cemetery led to the discovery of many ancestors he had long been looking for. His research took him across the country to rural Alabama. His destination was the Bethel Cemetery located in the northeast corner of Butler County. After loading his research materials in the rental car, he began the hour drive from Montgomery to the Bethel Cemetery, wondering if his trip would be successful. Evening was closing in and he hoped that he would be able to locate the cemetery and glean the information needed. A few miles before his destination, he noticed the small Sandy Ridge Cemetery off the side of the road. He knew this wasn’t the Bethel Cemetery, but for some reason he felt he needed to pull over and explore. Much to his surprise, he found the headstones of a husband and wife whose names he recognized from prior research, but had never known where they were buried. What happened next made the entire trip worth it. There, nestled in the grass next to the couple, was the small headstone of a child—their child, who had died in his infancy. He was elated to find this information on the little boy, and to fill in missing pieces to the family puzzle. He continued on to the Bethel Cemetery and there, with the help of local historians, was able to find the headstones of many other family members—answering many more questions. We love this story. It confirms to us the value of cemeteries as a source of history and a source for answers. This is what NAMES IN STONE is all about . . . preserving cemetery information and making it available in such a way that questions can be answered, and loved ones remembered. NAMES IN STONE is a unique online repository designed to help researchers find and document cemetery records AND maps. Interactive maps that show each grave’s location allow the visitor to visualize families, and fill in the missing pieces to the family puzzle—much like our friend did on his visit to the two little cemeteries in Alabama. 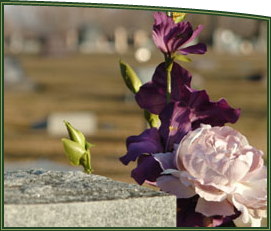 We encourage you to contribute to NAMES IN STONE by inviting your local cemetery to participate, by using the on-line mapping tools to add smaller cemeteries, and by sharing photos and other information with the online community. We hope NAMES IN STONE will help provide you with the answers you seek. Why is NAMES IN STONE Different? Current, up-to-date data enhances the research experience. Most cemetery sites provide a snapshot of deceased information as of a given date and are rarely updated with new information. NAMES IN STONE provides dynamic data, giving participating cemeteries and the public the ability to update information on the site as frequently as they choose. NAMES IN STONE is like having another employee who answers visitor’s questions about the deceased, the grave location, and other pertinent information. NAMES IN STONE allows cemeteries to easily upload their most current data, providing them with an off-site backup of their cemetery information. Best of all, this service is free to the cemetery. NAMES IN STONE peaks the interest of all those who like to visit cemeteries and pay respect to their departed loved ones. The public can search for the graves of relatives and famous people, and enjoy decorating graves with real and virtual flowers. Stay tuned for exciting news about future services and partnerships.